Veronika Carnaby: The Reader Magazine To Feature New Veronika Carnaby Short Story, "On Reading Aloud"
The Reader Magazine To Feature New Veronika Carnaby Short Story, "On Reading Aloud"
The Spring issue of the Liverpool-based, The Reader Magazine, is set to feature a brand new short story by Veronika Carnaby entitled, "On Reading Aloud". As stated on their official website, the quarterly publication "is the only magazine that offers the whole literary mix: new fiction and poetry, classic and neglected works, interviews with leading figures in the world of the arts, thought-pieces, advice for reading groups, research into reading, news from the world of books." The Reader Magazine serves as a staple to the Reader Organisation, which fosters a positive attitude toward reading and encourages literacy across the demographics. The magazine circulates throughout the UK and internationally. Subscribe to The Reader Magazine or purchase an individual copy at their official website to read Veronika's latest piece. 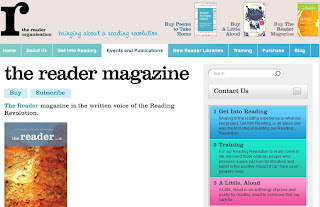 For more information on The Reader Magazine or The Reader Organisation, please visit http://thereader.org.uk/.